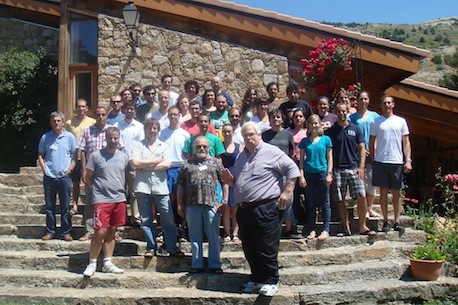 The 6th Summer School on Geometry, Mechanics and Control will be held in La Cristalera (Miraflores de la Sierra, Spain) on June 22th–26th, 2012. This School is an activity within the ICMAT Severo Ochoa Program. Registration: no later than May 20, 2012. Accommodation: no later than May 20, 2012. Scholarships: no later than May 10, 2012. Abstract submission for posters: no later than May 30, 2012. Abstract submission for posters: no later than May 30, 2012. Please send your abstract to gmcnet ull.es. In, The physics of structure formation (ed. G. Dangelmayr and W.Güttinger), Springer, 1987. Periodic Solutions near Equilibria of Symmetric Hamiltonian Systems. Proc. Roy. Soc. London, 325 (1988), 237-293. A. Chenciner, J. Gerver, R. Montgomery, and C. Simo. Simple choreographic motions of N bodies: a preliminary study. In Geometry, mechanics, and dynamics, pages 287--308. Springer, New York, 2002. A. Chenciner and R. Montgomery. A remarkable periodic solution of the three-body problem in the case of equal masses. Ann. Math., 152, 881--901, 2000. D. Ferrario and S. Terracini. On the existence of collisionless equivariant minimizers for the classical n-body problem. Inventiones Math., 155, 305--362, 2003. C. McCord, J. Montaldi, M. Roberts, and L. Sbano. Relative periodic orbits of symmetric Lagrangian systems. In EQUADIFF 2003, 482--493. World Sci. Publ., Hackensack, NJ, 2005. Loop spaces and choreographies in dynamical systems. PhD thesis, University of Manchester, 2011. If you wish to attend the School and/or receive further information about it, please complete the enclosed Registration Form. Please, fill in the information below, and return it by e-mail to gmcnet ull.es, not later than May 20, 2012. Are you an undergraduate or graduate student? The standard registration fee for participants is 200 Euros. The fee for students, postdocs and retired scientists is 100 Euros. Please, ask your bank to write explicitly in your transference order the name "5GMC + surname of the participant" and send confirmation (your name and transfer details) by e-mail to gmcnet [at] ull [dot] es or by fax to the number +34922318145, no later than May 15, 2012. A limited number of scholarships for PhD students, advanced undergraduate students, and post-docs, will be provided by the organizers in order to partially cover the travel and/or lodging expenses. If you want to apply for a scholarship, please send your CV (and grade certificate in case you are an undergraduate student) to gmcnet ull.es, not later than May 10, 2012. The price of the rooms at Residencia La Cristalera is 73 euros per day and per person (full board). The number of rooms that have been reserved by the organization is limited therefore we ask you to make the reservation as soon as possible (not later than May 20, 2012). Book a seat in the summer school bus before Monday, June 18, 2012. We are now arranging the transportation to La Cristalera in Miraflores de la Sierra. In order to facilitate how to get there, there will be a bus at C/Serrano 113 in Madrid at 7.30pm on Thursday, June 21, 2012. C/Serrano 113 was the previous home of the Institute for Mathematical Sciences (CSIC-UAM-UC3M-UCM). To get there from Barajas airport, you only need to take the subway, Line 8. This subway line has two stops in the airport, one in Terminal 4 and the other one in Terminals 1-2-3. The price is 4.50 euros. Get off at Nuevos Ministerios and walk for 15 minutes to get to C/Serrano 113. Here you can find a map about that walk. Once you have already picked up your luggage at the airport, it should take you around 45 minutes to get to C/Serrano 113. When the summer school finishes, we will have a bus on Tuesday, June 26, 2012 that will take you around 3pm from La Cristalera to C/Serrano 113 in Madrid. If you are interested in taking this bus, please send us an e-mail to gmcnetull [dot] es to book a seat for you. In the e-mail, please specify if you plan to take this bus both days, only on June 21 or only on June 26. If you are not able to catch this bus because of your flight schedule, please keep reading the following paragraphs. You can take a taxi from the airport, but this is an expensive choice (at least 90 Euros, but be sure to ask for the price beforehand). You can also take a taxi from the Airport to Plaza de Castilla (around 45 Euros) and then take a bus to Miraflores. A good choice is taking the Metro from the Airport to Plaza de Castilla, and then a bus to Miraflores. At the airport, take the Metro (underground), Line 8 (pink) to "Colombia" (3 stations). Transfer in Colombia to line 9 (purple) to "Plaza de Castilla" (3 stations). This should take about 25 minutes. In any case you can ask for a free map of the Metro when you buy a ticket. Once you have reached Plaza de Castilla there are a lot of bus stops between the two big inclined towers. Only one (number 725) goes to Miraflores de Sierra. Look for number 725 (Madrid - Plaza de Castilla to Miraflores de la Sierra, Bustarviejo). Here you can find the current timetable for bus 725. A taxi from Plaza de Castilla to Miraflores costs minimum 70 Euros. The trip to Miraflores de la Sierra takes approximately 60 minutes and departure is aprox. each hour from 7.30 a.m. to 23.15 p.m. Your stop is the next after "Soto del Real". Once you get off, you still have to walk around 20 minutes up along the main road to get to La Cristalera. A one-way ticket to Miraflores by bus number 725 costs about 5.10 Euros. Coming from the North, the train station is usually Chamartin. From Chamartin, you can take the Metro (line 10: dark blue) to Plaza de Castilla but it is only one station and it is also easy to walk from Chamartin to Plaza Castilla. If you arrive at Atocha, you can take the Metro (line 1: light blue, 13 stations) to Plaza Castilla and follow the above mentioned instructions for the bus. Take the big periferial highway M-40. If you come from the south, Portugal, or the Zaragoza Highways, take direction North (N-I). If you come from the Burgos Highway (N-I) take the direction M-607 Tres Cantos- Colmenar Viejo. Go out of the M-40 to the M-607 Highway towards Tres Cantos-Colmenar viejo. When the Highway ends (roughly 30 km) take the direction Miraflores. After 30 km you will reach the village. Once there, follow the signs towards La Cristalera, or Puerto de la Morcuera. One km outside the village you will find the entrance to the residence on your left (but watch out for it since sign is not a big one and may be missed.